Hi there! 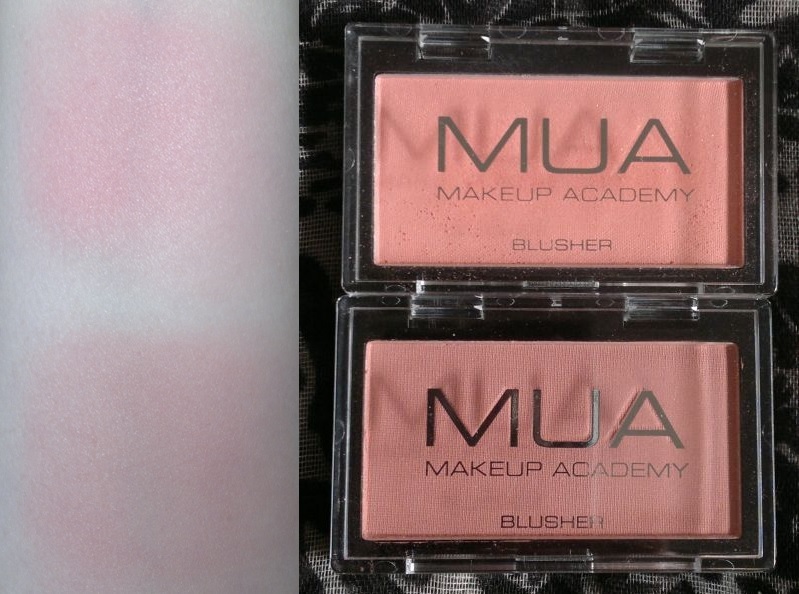 Today’s post is about a blush I picked up at one of the Poundstores. 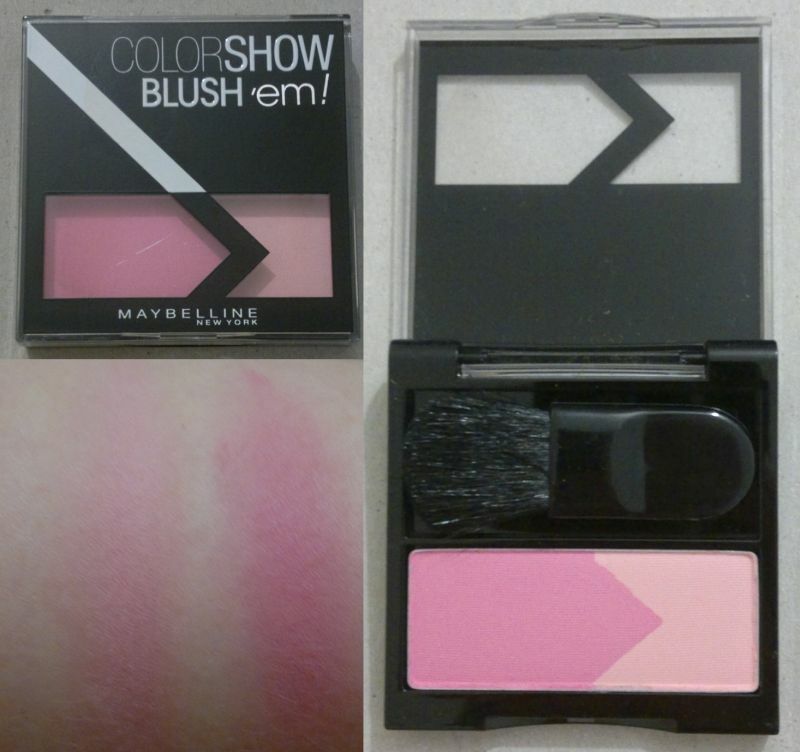 It’s called Maybelline Colorshow Blush’em! Unfortunately this blush doesn’t have a name – and I also couldn’t find a number on the back. So I’ve just called it ‘Pink Cheeks’. Now, how’s the product? I think this blush duo is actually decent. The pigmentation is OK – sure, it could be better, but again, I might be able to finish this one! This blush is easily blendable, and I think these pink shades are definitely suitable for pale skin tones. Hi there! A couple of weeks ago I spotted the most amazing blush on my friend Jodi’s blog. So I bought it – for £1! Now let’s have a closer look at this beauty – Essence Silky Touch Blush 20 Babydoll. I love the texture of this blush. It really is silky. And it applies like a charm! The blush is also highly pigmented, so a little goes a long way – and the blush will last me for quite a while. Excellent quality, amazing value! 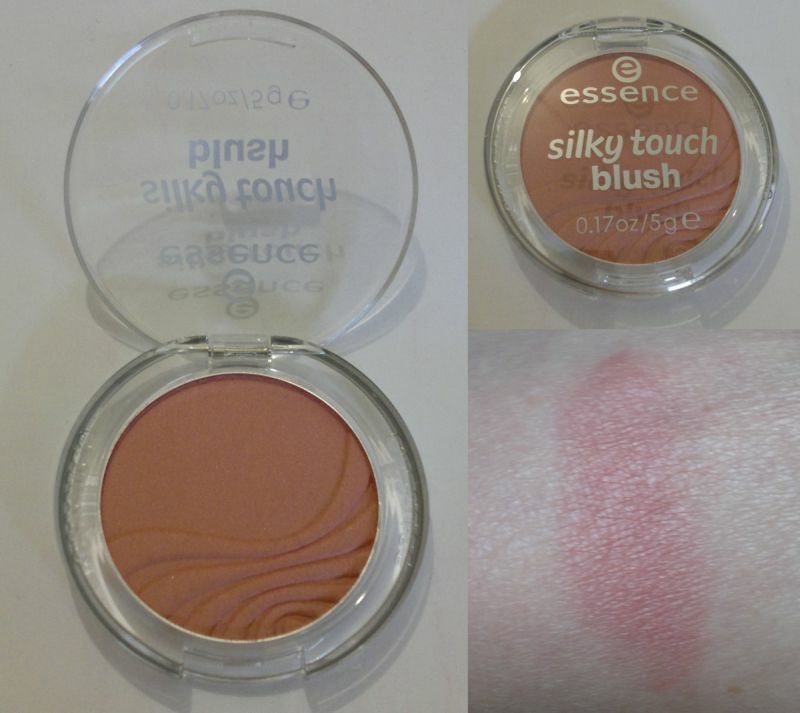 I would recommend Essence Silky Touch Blush 20 Babydoll to anyone who is looking for a lovely and longlasting spring & summer blush. So if you like this blush, swing by your local Wilko store (in the UK Essence is exclusive to Wilko) or check Wilko’s web site (the blush is £1 only online). Hi there! 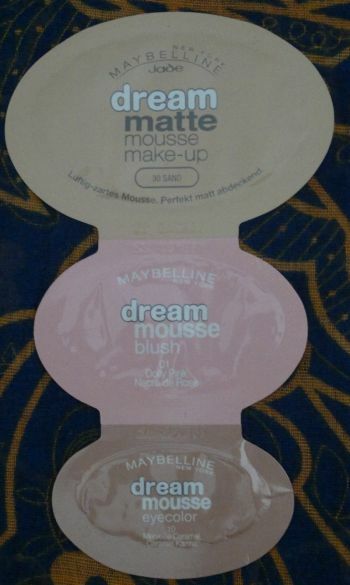 My latest quest to finally use all those free samples filling up my drawers led me to Maybelline’s Dream Mousse products. I didn’t do swatches because the samples didn’t contain much product. But I’ll tell you how these products fared anyway. I applied Maybelline’s Dream Matte Mousse make-up in 30 Sand with my fingers. The foundation was easy to apply and it felt very nice on my skin. I think the coverage is quite impressive. However, the product didn’t really work with my dry skin – it highlighted a big dry patch (the size of a 50p coin) which I didn’t even know I had. So I think this foundation is better suited to people with oily skin. I didn’t care for Maybelline’s Dream Mouss blush in 01 Dolly Pink. The blush was much thinner than the foundation and I didn’t manage to apply it as evenly as I had hoped (I’ve never used a mousse blush before). The good thing is that the blush can be wiped off or blended into the foundation easily, so mistakes can be corrected. However, the downside is that you really can wipe off the blush by accident. Also, this blush is glittery. And since it’s so very easily blendable, I looked like I had gold dust all over my face. This product is definitely not for me. Maybelline’s Dream Mousse Eyecolor in 10 Caramel Karma fared better than the blush. The shade is a beautiful shimmery light brown which was easy to apply and blend. Unfortunately the mousse eyeshadow didn’t stick to my eyelids. So I ended up with lots of small brown flakes under my eyes and on my cheeks. I tried to wipe off those flakes – very carefully – but this started the unfortunate chain of events which made my face look like it was sprayed with gold dust. Hi there! I’ve been using the same blushers for the past six months, so I thought it’s about time to try out new ones. As I love a bargain, I went with MUA. I picked the following blushers (from top to bottom): Bon Bon, Candyfloss and Cupcake. Bon Bon is a matte dark coral that goes with anything. 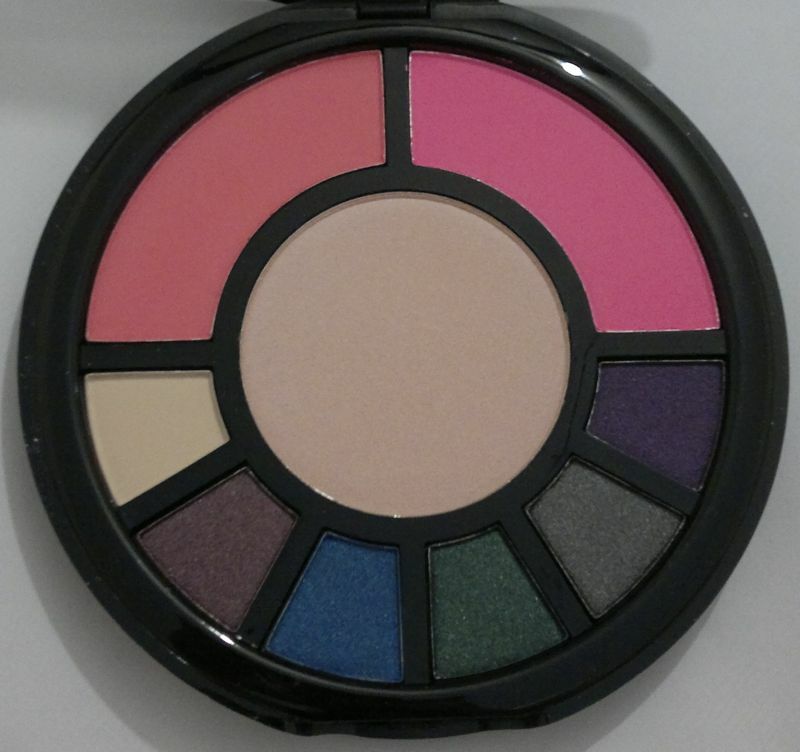 I think this shade would suit most skin tones and – depending on how much product you apply – most occasions. Candyfloss is a shimmery cool pink. The shimmer is quite subtle. However, I don’t like this shade as much as I thought I would because it’s too pink for my taste. Cupcake is a matte light brown. I like this shade because it reminds me of Bambi. 🙂 I also think this shade is subtle enough to go with heavy eye make-up. My favourite of the three is Bon Bon, followed by Cupcake and then Candyfloss. I’m very happy with the quality of these powder blushes because they last really well on my make-up and I rarely have to touch up during the day. Priced at £1 each these MUA Blushers are great value. Hi there! 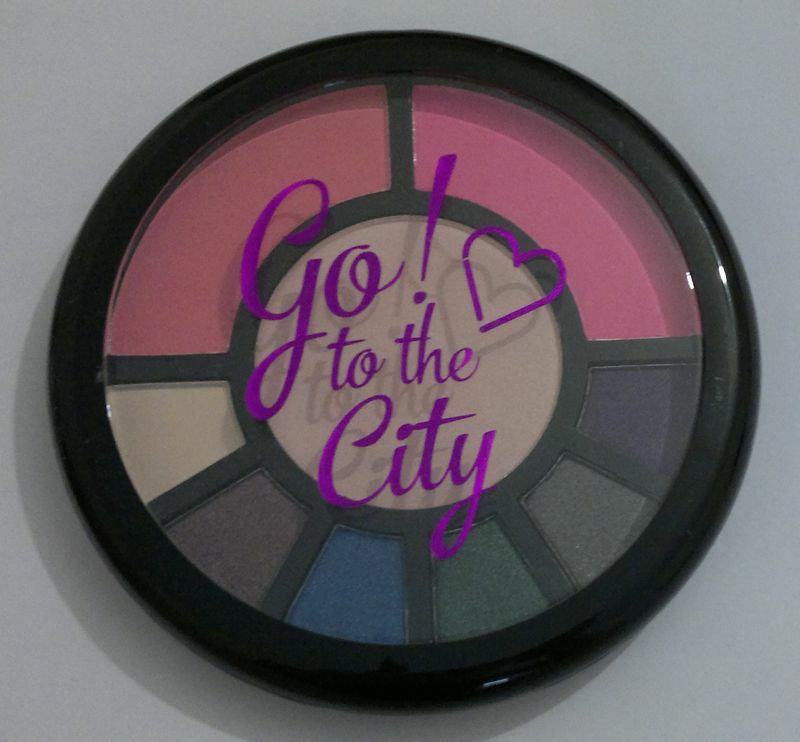 I know quite a few bloggers went nuts during MUA’s winter sale, and I was one of them. I snapped up lip and nail products, eyeshadows and two blushers. 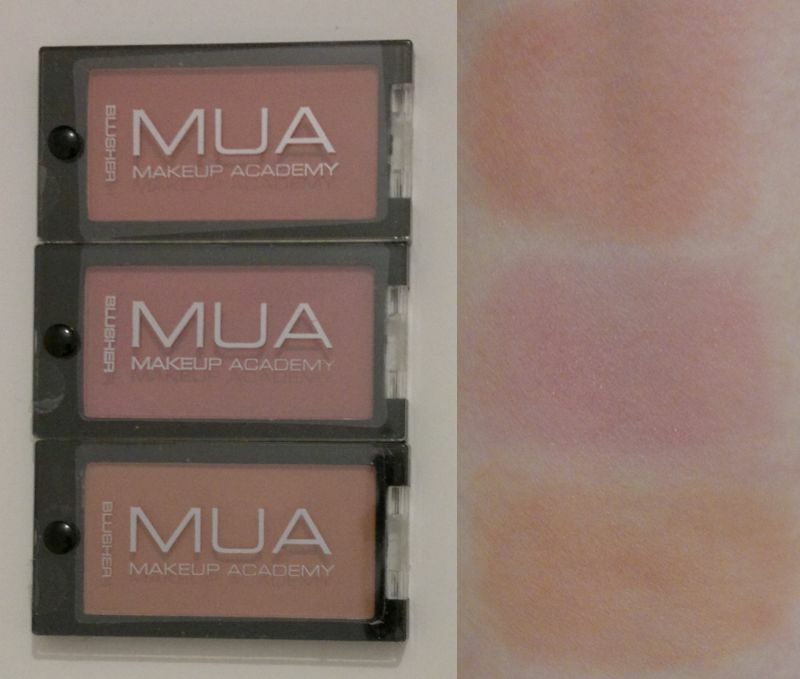 These little beauties are simply called MUA MakeUp Academy Blusher Shade 1 and Shade 2. I’m sorry the swatches came out a little pale in the photo, but I believe they still show the vibrancy of Shade 1 and the classic beauty of Shade 2. Shade 1 (top) is a bright coral with a hint of shimmer. But fear not, the shimmer is invisible on the cheeks. I think it’s a pretty shade for spring and summer and I really enjoyed wearing it for the past few days. Shade 2 (bottom) is a soft matte vintage pink which, I think, is perfect for all seasons. It’s a classic shade that will always look good. In terms of quality I couldn’t be happier with these blushers. They last and look pretty all day long. When I bought these blushers they were 50% off, but even at full price – which is £1 each – they’re still an incredible bargain. Well done, MUA!